Synthetic peptide conjugated to KLH derived from within residues 300 to the C-terminus of Human WDR5. 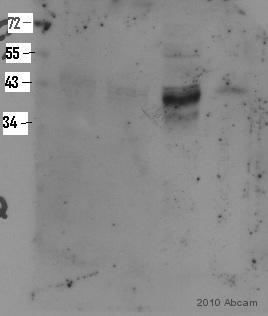 This antibody gave a positive signal in western blot in the follwoing whole cell lysates: HeLa; A549; NIH3T3. This antibody gave a positive signal in the following Formaldehyde fixed cell lines: HEK293. Our Abpromise guarantee covers the use of ab22512 in the following tested applications. WB Use a concentration of 1 µg/ml. Detects a band of approximately 40 kDa (predicted molecular weight: 36 kDa). Belongs to the WD repeat WDR5/wds family. Additional bands at: 17 kDa, 75 kDa. We are unsure as to the identity of these extra bands. 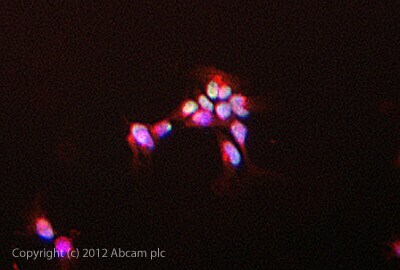 ICC/IF image of ab22512 stained Hek293 cells. The cells were 4% formaldehyde fixed (10 min) and then incubated in 1%BSA / 10% normal goat serum / 0.3M glycine in 0.1% PBS-Tween for 1h to permeabilise the cells and block non-specific protein-protein interactions. The cells were then incubated with the antibody ab22512 at 1µg/ml overnight at +4°C. The secondary antibody (green) was DyLight® 488 goat anti- rabbit (ab96899) IgG (H+L) used at a 1/1000 dilution for 1h. Alexa Fluor® 594 WGA was used to label plasma membranes (red) at a 1/200 dilution for 1h. DAPI was used to stain the cell nuclei (blue) at a concentration of 1.43µM. Publishing research using ab22512? Please let us know so that we can cite the reference in this datasheet. I have attached the reference where the authors have used anti WDR5 antibody for probing WDR5 in HCT116 lysate. For western blot the authors have used antiWDR5 (ab22512).It would be great if you can send me this particular antibody as replacement. I am sorry this product did not perform as stated on the datasheet and for the inconvenience this has caused. As requested, I have issued a free of charge replacement for one vial of ab22512. I am using the Anti-WDR5 antibody (ab22512) and my Western Blots are not looking as good as what you have shown. I was wondering if you could send me the conditions you have used? Thank you for your enquiry. I am sorry to hear ab22512 is giving you trouble. I don't have a specific protocol to use with this antibody but if you could let me know some more about your sample preparation and experimental protocol I'd be happy to offer any tips I can.